Over 25,000 Actors, Acting Students, Directors, Dancers, Playwrights, Choreographers, Musicians, Authors, Set Designers, Costume Designers, Sound Designers, Casting Directors, Agents, Producers, Casts of Broadway and Off-Broadway and Off-Off Broadway shows, Arts Professionals, Artists, and Theater Lovers read The Soul of the American Actor newspaper – the most respected Theater Arts Newspaper in America and the only Newspaper in the world dedicated to the creative process in print and online today. The Soul of the American Actor has become the soul of the artist today. The Soul of the American Actor is published both in printed form on paper and in a limited edition online throughout the year. Distribution: By subscription and personal visits. If you wanted it mailed directly to you and to not miss an issue: Subscription price: $16 per year mailed via U.S. Postal Service. When in the event of non-payment, publisher shall have the right to hold advertiser and/or its advertising agency jointly and severally liable for such monies as are due and payable to publisher. Rendering a bill to the advertiser's advertising agency shall not relieve the advertiser in the event of non-payment by the agency. If payment is not actually received by the publisher it will constitute payment even if the payment is received by advertising agency. The advertiser and its advertising agency shall be responsible, jointly and severally, for all content of advertisements (including text, illustrations, trademarks and any other matter) and shall defend, indemnify and hold publisher harmless from and against any loss, expense or other liability, including publisher's actual attorney's fee, resulting from any claims or suits for libel, violation of rights and privacy, plagiarism, copyright infringement and any other claims or suits that may arise out of the publication of such advertisements. All advertising is subject to publisher's approval. The publisher will not be held liable if, for any reason, it becomes necessary to omit an advertisement. If there are any errors in an advertisement they should be reported to the publisher upon publication. Publisher's liability is limited to first insertion in which errors occur that are the direct result of the publication's printing, mechanicals or typesetting. If an ad appears in an issue with incorrect information, it will be placed in an upcoming issue with the correct information at the Publisher's discretion. The Publisher will not be liable to refund any amount due to any errors. Any conditions (printed or otherwise) appearing on space orders, billing instructions or copy instructions, which conflict with the publisher's stated policies, will not be binding on the publisher. Publisher will not be held liable for failure to perform or delay in performance caused by strikes, accidents, fires, acts of nature, or other contingents beyond the publisher's control. Size samples of online ad are one this page. All online ad can of course be in color. There may be some shift of color on different monitors. The Subscribe Ad for the Newspaper is an example of a Flash Ad. Left Column Ads are very narrow and may not suitable for many advertisers, please consider this when choosing ad sizes. A common ad size in the printed issue of the newspaper is the 5" x 1 Column Ad. 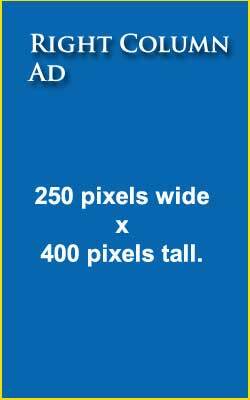 This ad can be converted to fit nicely into the Right Column Ad at the height of 385 pixels. It can easily be conveted to this size for online advertising. Please take note however that the ad will remain black and white. Another popular ad size in the printed issue of the newspaper is the 5" x 2 Column Ad. This ad does not convert to the online ad sizes. And so would have to be remade into one of the other size ads like a Full Banner. The printed issue ads of Full Page and Half Page also do not convert to the online ad sizes and would have to be remade for the online issue. We will be happy to make your ad - please check with Mr. Barron for a quote. Flash ads are charged on an hourly rate of $50 per hour. An estimate will be given before any work is begun. Online ads can be jpeg (jpg), gif, animated gif, or flash (swf). We reserve the right to decline ads too large that slow the loading of any page down. We will give file sized targets as we discover them. Links: for all ads in formats other than except flash please send the link when emailing information about the ad. For Flash ads ad the link into the flash ad and please set the target to blank, or we can not post your ad. For any technical questions please contact Doug Barron at:dougsbarron@gmail.com or 212-947-1608. The paper version of the paper is printed at an 85 lpi (line screen per inch), therefore bitmap graphic files are recommended to have a resolution of double that of 170 dpi (dots per inch) at 100% of the size of the graphic to be used in the paper. We Design Your Ad: We in fact design over half of the ads that appear in the newspaper. If you'd like us to design your ad for you please contact Ronald Rand at RonaldRand@soulamericanactor.com, and Doug Barron for design and technical elements.